Sinner condemned in Tartarus to an eternity of rolling a boulder uphill then watching it roll back down again. 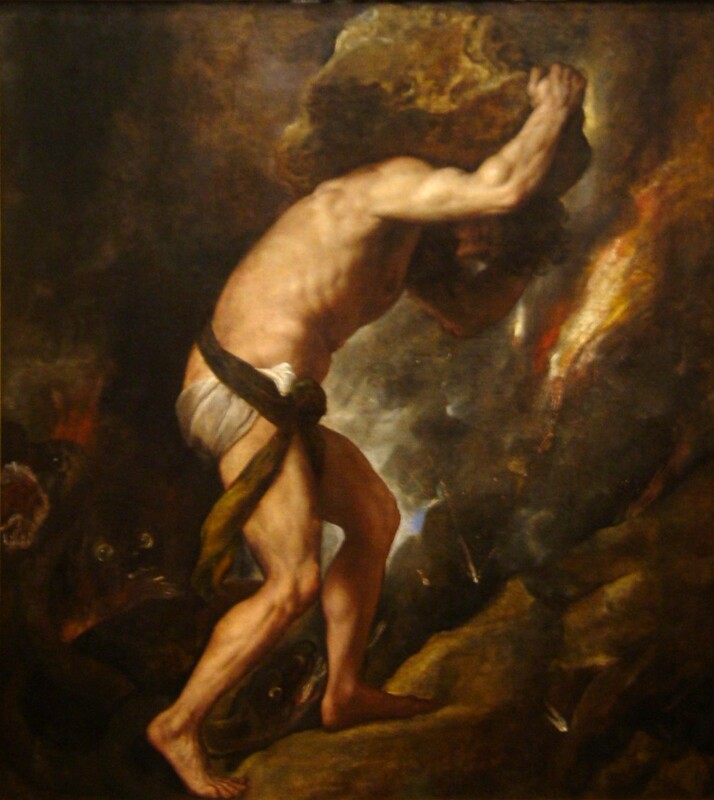 Sisyphus was founder and king of Corinth, or Ephyra as it was called in those days. He was notorious as the most cunning knave on earth. His greatest triumph came at the end of his life, when the god Hades came to claim him personally for the kingdom of the dead. Hades had brought along a pair of handcuffs, a comparative novelty, and Sisyphus expressed such an interest that Hades was persuaded to demonstrate their use – on himself. And so it came about that the high lord of the Underworld was kept locked up in a closet at Sisyphus’s house for many a day, a circumstance which put the great chain of being seriously out of whack. Nobody could die. A soldier might be chopped to bits in battle and still show up at camp for dinner. Finally Hades was released and Sisyphus was ordered summarily to report to the Underworld for his eternal assignment. But the wily one had another trick up his sleeve. He simply told his wife not to bury him and then complained to Persephone, Queen of the Dead, that he had not been accorded the proper funeral honors. What’s more, as an unburied corpse he had no business on the far side of the river Styx at all – his wife hadn’t placed a coin under his tongue to secure passage with Charon the ferryman. Surely her highness could see that Sisyphus must be given leave to journey back topside and put things right. Kindly Persephone assented, and Sisyphus made his way back to the sunshine, where he promptly forgot all about funerals and such drab affairs and lived on in dissipation for another good stretch of time. But even this paramount trickster could only postpone the inevitable. Eventually he was hauled down to Hades, where his indiscretions caught up with him. For a crime against the gods – the specifics of which are variously reported – he was condemned to an eternity at hard labor. And frustrating labor at that. For his assignment was to roll a great boulder to the top of a hill. Only every time Sisyphus, by the greatest of exertion and toil, attained the summit, the darn thing rolled back down again. Yup. That’s how I feel today. Both make me think of teaching. And both make me want to throw rotten fruit at Hillary Swank trying to tell me how to inspire children to become writers of freedom. I have the same visceral reaction. If I could have hit the “double approve” comment button, I would have! Now I’m going to get out my pearls and cashmere sweater set and save the world from itself.